Most people would probably think of dancing when they hear the word “Jitterbug”. I, on the other hand, think of cookies. Jitterbug cookies are an old Swedish classic. I remember having them once as a kid. Thinking about it, that may be the one and only time I have ever had them. 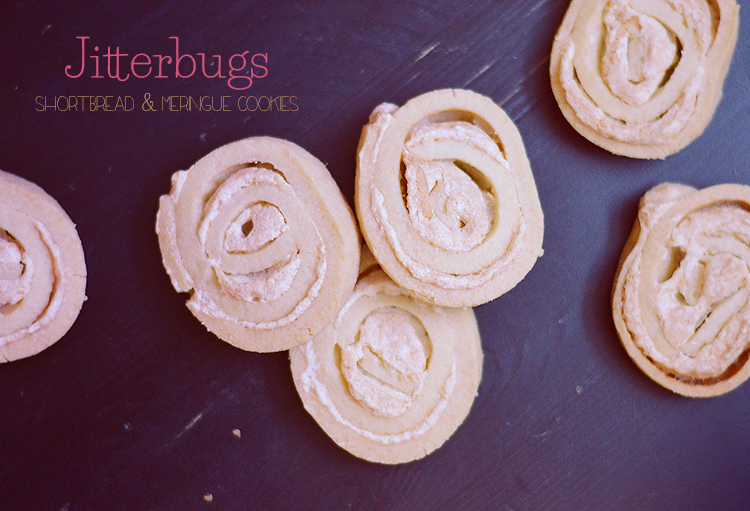 But ever since, every time I hear anyone mention Jitterbug cookies I get a pang of nostalgia and remind myself I have to get around to baking them. 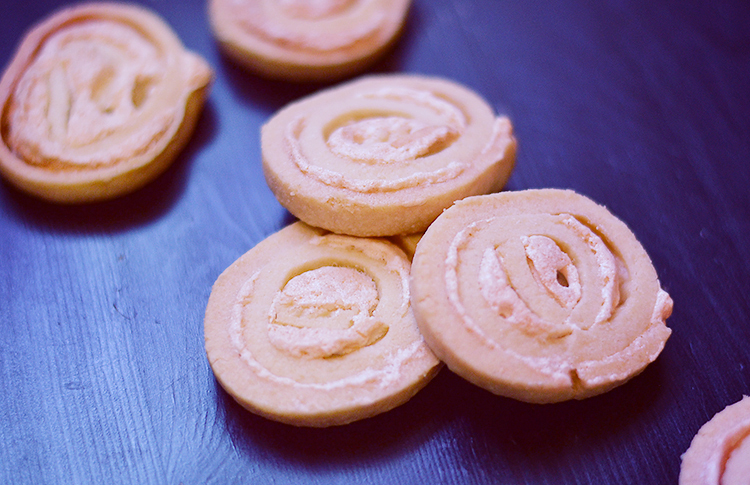 The base is a simple shortbread cookie dough – butter, flour and sugar. You can use a kitchen assistant to work the ingredients into a smooth dough. I used my monster muscles and kneaded the dough by hand. Wrap it up in plastic wrap and let it rest in the fridge for an hour. 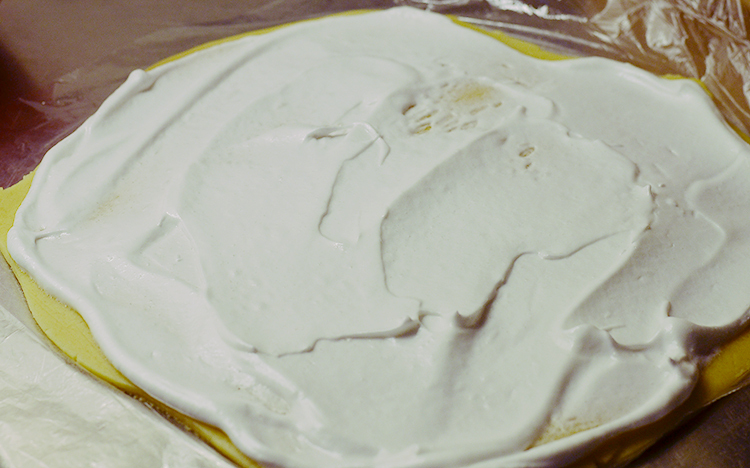 Meanwhile, whip egg whites until stiff, then add sugar until glossy peaks form. Divide the chilled ball of dough in two. 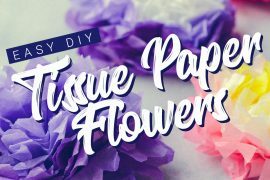 Roll out each half between sheets of plastic wrap until you get a nice rectangle. Try to work kind of quick, you don’t want the dough to get too warm and soft. Spread half of the meringue on each rectangle and carefully roll it up starting at the long end, like you’re making a swiss roll – use the plastic wrap as an aid, it makes it so much easier to roll it up! Place on a cutting board and set aside in the freezer for 15-20 minutes. While you heat up the oven. Cut into 1/2 inch (2 cm slices), place on baking trays lined with parchment paper and bake for about 15-20 minutes depending on how frozen your dough is. Mix the flour and sugar. 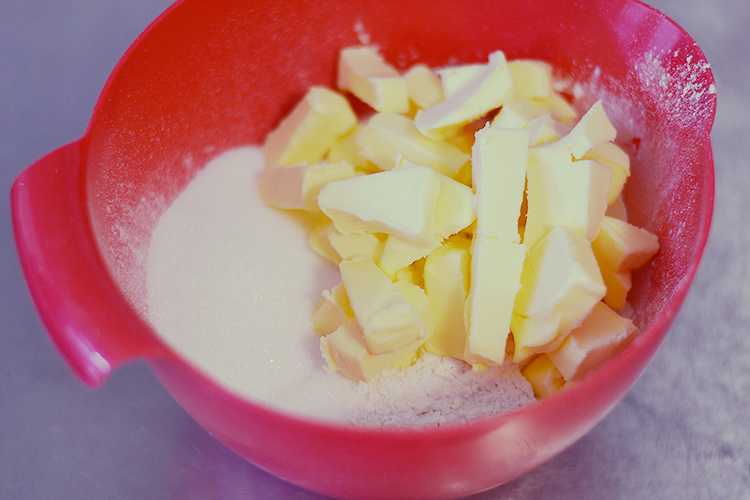 Cut the butter into cubes and work it into the dry ingredients until you have a smooth dough. 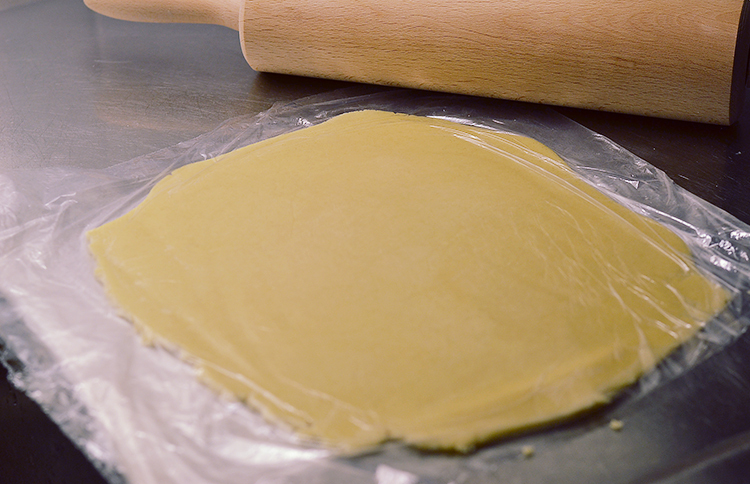 Wrap the dough in plastic wrap and set aside in the fridge to chill for 1 hour. 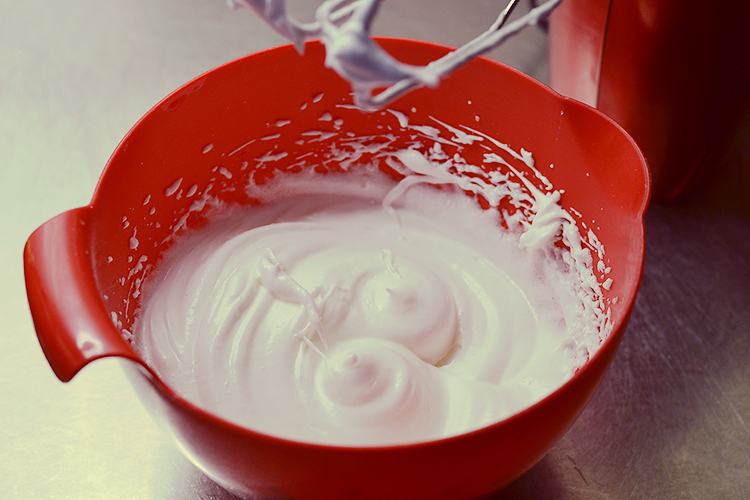 Whip the egg whites until stiff, slowly add the sugar while continuing to whip the egg whites, until stiff peaks form. 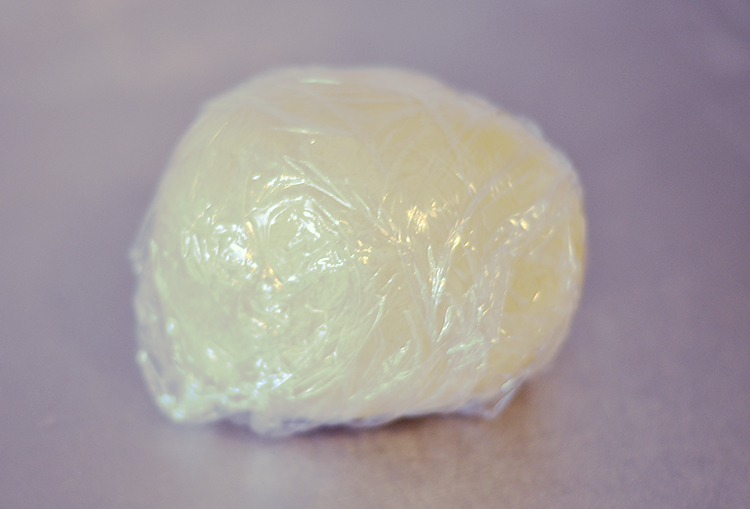 Divide the chilled dough into two equal parts and place between sheets of plastic wrap. 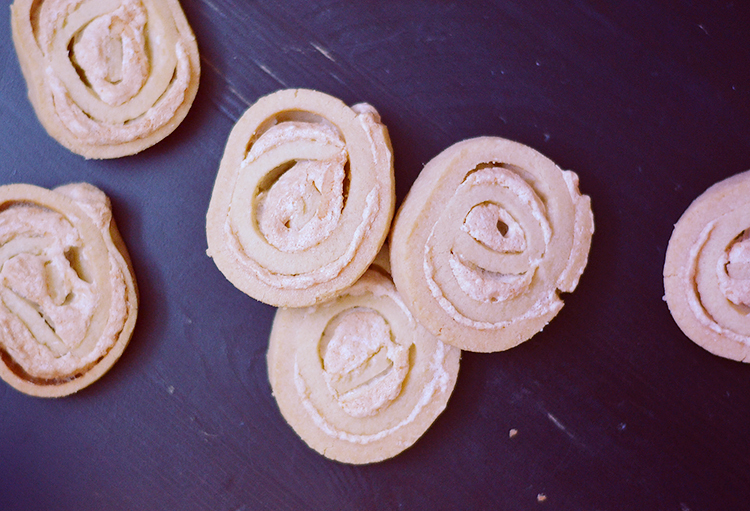 Roll out into two rectangles and spread half of the meringue on each rectangle. 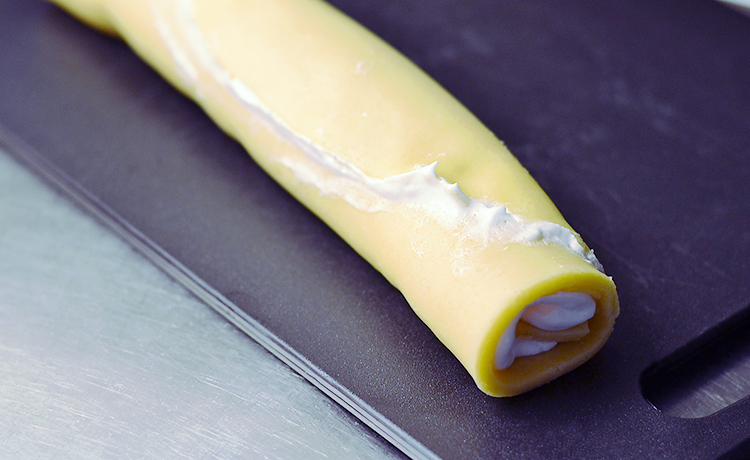 Using the plastic wrap as an aid, carefully roll the dough into a log, as if you were making a swiss roll cake. Place the logs on a cutting board and set aside in the freezer for 15-20 minutes. 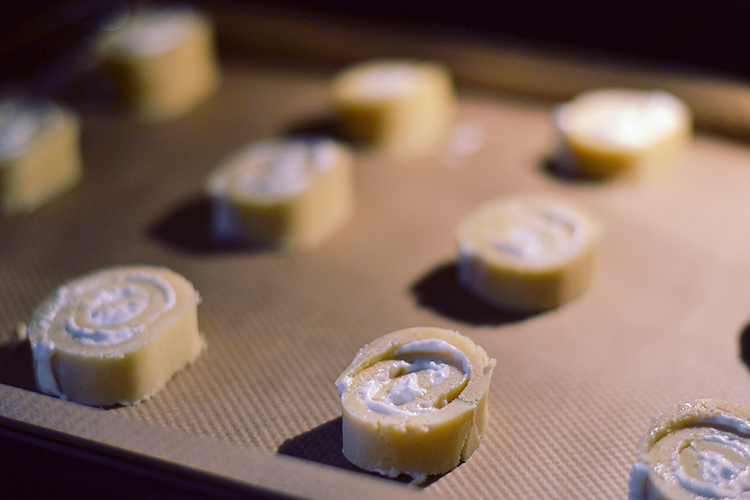 Meanwhile, heat the oven to 347 F / 175 C and line a couple of baking trays with parchment paper. Cut each log into 1 inch / 2 cm pieces and place on baking sheets, an inch or two apart. Bake in the middle rack of the oven for 15-20 minutes (depending on how frozen your dough is) until edges and meringue have started to brown slightly (keep an eye on them so they don’t burn). Allow to cool on baking tray for 3 minutes, then transfer to wire racks to cool completely. Store in airtight containers in the fridge.